Here's the latest action by Celtics draft and stash 1st rounder Guerschon Yabusele. 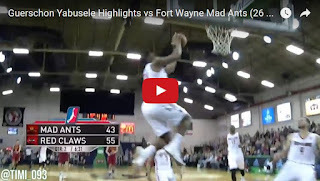 Frenchman was just one rebound shy of a double-double, scoring 26 points (10/14 from the field, 2/3 from downtown) to go along with nine boards, two assists and two blocks as the Red Claws won crucial Game 3 and advanced to the next round of D-League playoffs. They will play against Toronto Raptors 905 team in a best-of-three series.